Rainy days can be really boring. All day long, rain pouring down on your window, while grey clouds are covering the sky. The problem occurs when you have to go out. What’s the rainy outfit? The eternal question for those who want to look chic but still ready for the raining cats and dogs. 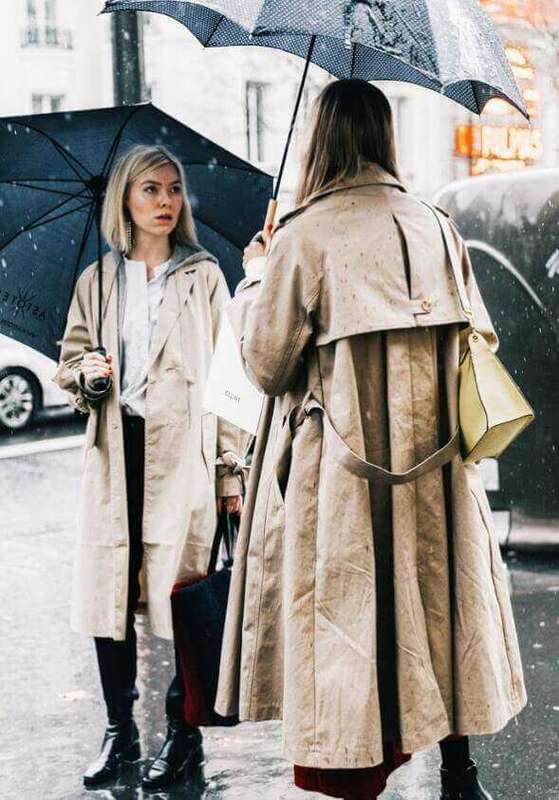 Umbrellas, waterproof boots, and trench/raincoats become the part of your everyday routine. And you know what happens when you go out without them. You get all wet. 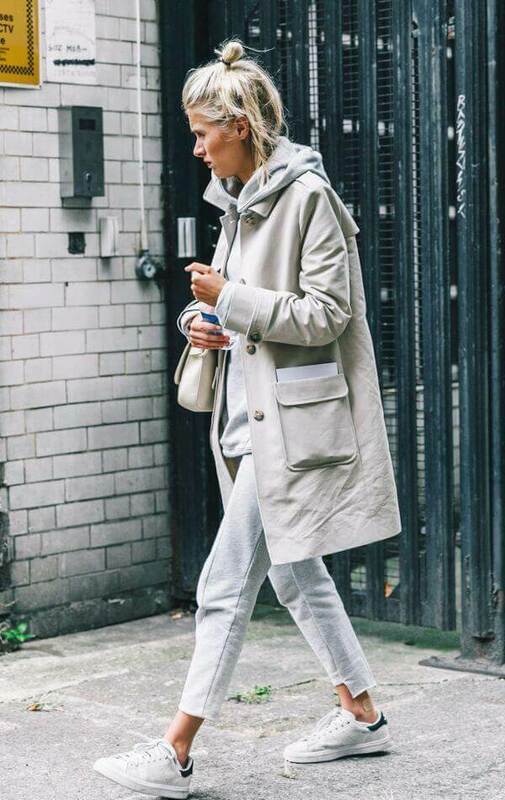 To show you how to look stylish and chic even on rainy days, I have gathered around some of the best looking outfits of the amazing It Girls. They really nailed all those rainy day outfits. Who is the better than them to find a great inspiration? How to dress for a rainy day? 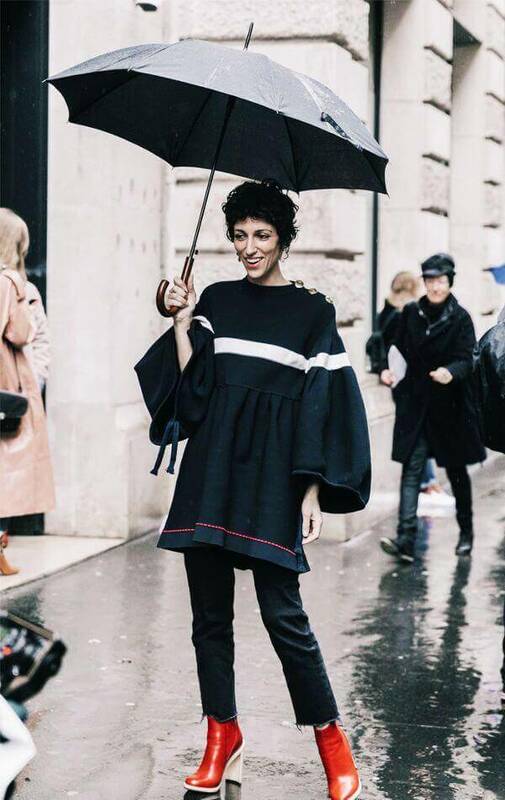 10 Rainy Outfit Ideas To Start With! Let’s begin with the classic garments. When it comes to rainy and grey days the first thing coming to my mind is trench coat. It is such a classic piece of clothing that is typical for fall and spring transitional weather. It is a very versatile garment, and so easy to work with. It goes perfectly with jeans, dresses or skirts, as well as with sweaters, tops or blouses. The best thing is that you can combine it with both heels and flats. Red boots were a huge trend last year. They are here to stay, so don’t worry, you can wear them this year too. On a gloomy, rainy days, there is no better mood lifter than some bright colored details like red pants, boots or coats. When it comes to jeans or pants, make sure that they are with frayed hem and away from the puddles. Keep your outfits in basic, neutral color, and let your boots speak for themselves. The spectacular comeback of vinyl and patent leather last year left me without words. In the beginning, I thought it would not be such a big thing, but these materials exploded all over fashion scene. However, you have to admit – they are perfect for rainy day outfits. Being waterproof, while keeping you cozy is their main function. After all, they are super chic and stylish. Don’t forget your oversized umbrella! We all know that white color is not very appropriate for rainy days. However, if you are a big fan of bright neutral colors, then wear the color of the sky – grey! This mix of sporty and casual outfits is perfect for everyday wear. If you need to go to the store, to pick up coffee to go or something else, go with this combination. It is chic and very comfortable at the same time. Moreover, that is the most important thing. Transparent as a trend appeared a while ago, and it is here to stay. Transparent and sheer clothes were one of the main obsession of many designers and fashion girls. 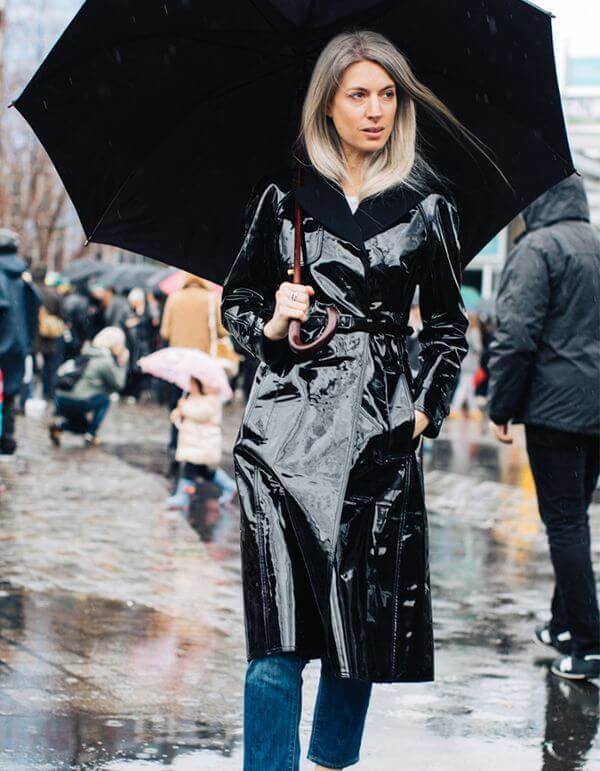 If you want to look fancy and modern, style your transparent raincoat with a leather mini skirt, and a black button-down. Since the red was color of the season, make sure to include some of the red details in your rainy day outfits. On a rainy day, there is no better company for you than your bestie. You can even think about matching your outfits! Why not, you will look stylish, modern and you will definitely stand out from the crowd. These two girls decided to go classy, with long trench coats in beige and olive green color. Ankle boots, and small shoulder bags along with your umbrella are things you shouldn’t forget when you leave your house. Rainy days can be fun. If it is spring, you know that they will turn into something much nicer-sunny weather and summer. However, when it comes to a fall or winter rain, it really can be boring and not pleasant at all. Cold weather plus rain can make you really feel not-fancy-at-all. That is why you should wrap yourself in something very warm. Teddy bear coats are ideal for that! You can style it with black backpack and jeans. Don’t forget your umbrella and make sure to put some scarf over your neck, for feeling extra warm. I know that I have said that pastel colors including white are not appropriate for the rainy weather. But, come on, you cannot let the rain to ruin the elegant outfit that you have planned for so long. Nice and baby blue coat is great to wear with bright ripped jeans and sparkly high heels! Furry details on the sleeves are optional, of course. They definitely give you an extra dose of glamour. Hunter boots are salvation for rainy day outfits. They are fancy and modern as well as very practical for when it’s pouring. You can style them with skirts, dresses or jeans. Don’t hesitate to buy one pair because they will serve you well. This girl showed us how to wear ripped jeans with the striped navy-blue coat, colorful and oversized scarf and black rain boots. It’s the perfect outfit for everyday wear. Stayin elegant on those rainy days is not an easy task to do. However, I will show you how to do it very quickly and efficiently. Style your military navy blue blazer with bell bottoms and retro shoes. For ultimate look add sunglasses and long navy-blue coat. To break this all-blue combination, wear a red button-down under the blazer. This combination is very easy to style, and it is perfect workwear inspiration. Don’t let rainy days change your outfit plans! Truthfully speaking on rainy days, it is the best to stay under the warm blanket and to read some book or listen to music. However, that is not always possible. That is why I’ve tried to show you how you can look equally cool and chic on rainy days as well as on sunny ones. I hope that you have found something for yourself and that you will try to ‘copy’ some of these outfit ideas. Previous articleHow to Decide What Should I Wear Today?